Mr Mosquito lives on Mercury, but he hates it there. The days are 800 degrees and the heat melts his flip-flops, while the long nights are almost 300 degrees below zero! His toothpaste is always frozen. One day Mr Mosquito looks through his telescope and sees all the happy mice living on Earth. He decides it’s the perfect planet for a mozzie like him to take over! So with a powerful ray, he zaps his fingernail clippings and grows them into massive mutant mosquitoes who climb aboard a spaceship to conquer Earth! 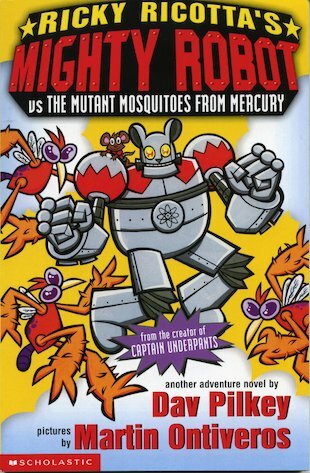 When the evil insect invaders strike, will Ricky Ricotta and his giant robot be able to save the day? Find out in this fabulous feast of flip-o-ramas, comic strips and funnies! Dav Pilkey is the author of the bestselling Captain Underpants series. Dav Pilkey has won several awards in the US, including the Publishers’ Weekly Funniest Book of the Year award for The Adventures of Captain Underpants.